While I understand your frame of thinking, I have to respectfully disagree w/ most of your assessment of modern comics & films. While I do agree the campiness of earlier DC comic adapations (and costumes, of course…) should be updated (Aquaman, Wonder Woman, etc.) the spirit of each character should remain intact. 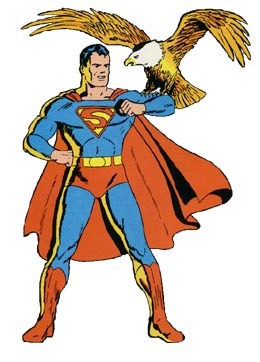 Superman is an iconic character, and if he is to be portrayed in a “modern vein”, he would cease to be Superman. What makes the character so appealing is that he has always been reliable, and has bucked the trend. No matter how much the world changed, we could always count on Superman (which, of course was a point “Superman Returns” kind of missed w/ his deadbeat dad routine…) While the world goes pessimistic and “dark”, Superman as a character remained a symbol of optimism and always tried to do what is right, despite his limits & shortcomings. Your assessment of modern times equal modern films doesn’t not hold weight when put up against films like the “Lord of the Rings” trilogy, where Aragorn is virtually incoorruptable, “Jesus-like” and noble. These films made huge box office because people crave nobility an honor, even if the world is crumbling around them, so to speak. “Superman Returns” was not a total failure, and no matter what direction the film took, someone was going to complain or be disappointed by it. Basically, it came down to too little action in the film, which translates these days into poor box office. I’ll admit, aside from some of the many acknowledged plot holes in the film (super kid-yuk!, Lois Lane married, kyptonite effectiveness, etc. ), what ultimately made it “unsuccessful” was a weak storyline and a weak villain. In short, SUPERMAN IS AN EPIC HERO AND HE NEEDS AND HE NEEDS TO BE CHALLENGED BY AN EPIC VILLIAN, LIKE BRANIAC OR DOOMSDAY. With such a villian the film could have explored Superman his “god” complex; when he is challenged and maybe even defeated, he can then become introspective on his own mortality and limits. Having said that, if “Superman Returns” was a 2 1/2 hour slugfest w/ half of Metroplois in rubble by the films end, the film would have-could have been a major success. Personally, I think the “dark” hero routine is getting worn-out. If every character & movie is going to mimic “The Dark Knight” in tone (which was an excellent film, by the way…), why bother making anymore comic movies at all? They will only be a variation of the same theme. Anyway, this is just my opinion and thanks for hearing me out.